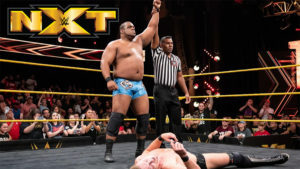 Keith Lee debuts in NXT, Tommaso Ciampa gets more than he bargained for, Conti and Borne battle for a spot in the Mae Young Classic, and more on a pretty good episode of NXT. The Undisputed Era is scheduled to defend their tag titles against SAnitY, but Cole, O’Reilly, and Fish have different plans on an entertaining episode of NXT. Pete Dunne puts his title on the line against Johnny Gargano, and Ruby Riot attempts to settle things with Sonya Deville on an episode of NXT that is essentially a Takeover wrap-up (with two very good matches). The last NXT before Takeover: Brooklyn III gave decent time to the women’s and men’s title matches. Thought nothing major happened, it was a good lead-in for the big show this weekend. The Street Profits make their NXT TV debut, Andrade Almas looks to get back on track against No Way Jose, and Oney Lorcan gives Danny Burch a rematch in an okay but rather uneventful episode of NXT. Johnny Gargano returns to in-ring action against Raul Mendoza and Kyle O’Reilly tests Aleister Black in a good episode of NXT.